I’m writing to deliver a letter to you from the Amazon. The letter tells the terrible story of Chevron’s abuses in the remote rainforests of northeastern Ecuador. It is a raw and courageous letter, filled not only with outrage but also with hope and urgency. 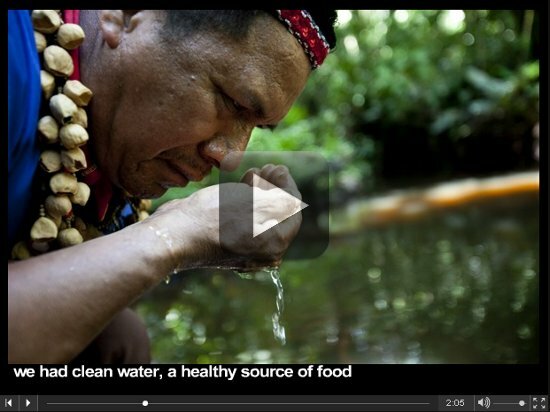 Watch this Open Letter to the United States from the Ecuadorian Amazon – in video form – and please sign this urgent petition to show solidarity with the Ecuadorian people in their fight for clean water and good health. Make sure you also join our Stop Chevron: Defend the Amazon Cause! After nearly 18 years of struggle by the communities in the Amazon to hold Chevron accountable, an Ecuadorian court has found the oil giant liable for upwards of $18 billion in damages for the company’s environmental crimes. Now, in the face of Chevron’s promise to fight the verdict “until hell freezes over,” three courageous Ecuadorian leaders have traveled to the United States to demand that Chevron clean up its toxic legacy in the Ecuadorian Amazon, once and for all. Please sign and share this solidarity petition, and help us get one signature for each of the approximately 30,000 men, women, and children in the Amazon who continue to suffer from Chevron’s toxic legacy in their homeland. Today, a delegation of Ecuadorian representatives of the affected communities have arrived in the United States to appeal to shareholders and directly confront Chevron leadership at the company’s annual shareholders meeting next week. Along with our allies at Rainforest Action Network and other supporters, Amazon Watch will deliver your statement of solidarity directly to Chevron at the meeting on May 25th. Stand with the Ecuadorians! Answer their courageous call! P.S. Don’t forget to join our Stop Chevron: Defend the Amazon Cause as we bring our campaign to the next level and demand Chevron do the right thing.